Oh my, what was I thinking?! 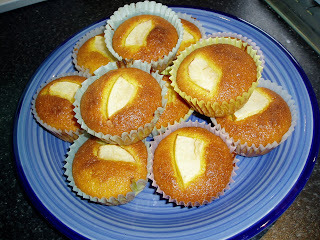 I thought it might be fun if the kids and I made this delicious recipe for Apple Custard Teacakes, which I found on my sister's blog, courtesy of sugarfishblog. Well, the first thing was the fight over the little table I let them stand on - we found out Miss-almost-two has a mighty push in those little arms. Once that is sorted out, we measure and mix (spill, slosh, taste custard powder, sift everywhere but the bowl). 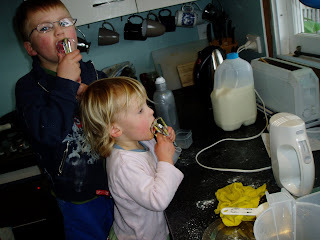 Then I turned around from having a quick scull of my cup of tea to find them both elbow deep in the sugar container, munching it up as fast as possible. 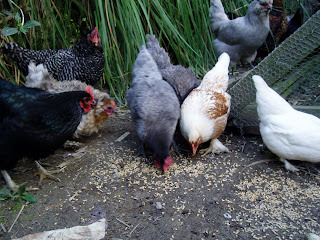 I gave them each a beater to lick to distract them while I wiped up (I know, raw egg, bad mother, but they are from my own chooks so I'm confident they won't get sick from it). And then sent them to wash their stickiness away. Mister-four-and-a-half comes back and says,"Come and see what O did, Mum! It's a big disaster!" (Where did he pick up such a turn of phrase?!). So in the bathroom was dear daughter almost overflowing the sink because she has dumped a toilet roll in the basin, hmmmm, breathe deep. I cave in at this point, turn on the TV and finish off the baking myself! Verdict: very, very good! I didn't bother with the cinnamon and sugar and butter on top afterwards and the kids ate them just fine (apple and all). They are very yellow because I used three small eggs instead of two and they are free range with really golden yolks. These will go down in the family recipe book for making again! One happy boy and one lively dog! Yup, the dog is fine! Yay!! We had a phonecall from the vet the other day to say that her blood test was negative for Warfarin (which is the drug in the poison). Yay for washing soda is all I can say. She would almost certainly be dead if we hadn't been able to make her vomit it up so fast. It's made me think a bit. Not just about keeping poisons and chemicals safe but more about using them in the first place. I was having a chat to someone who's dog was also poisoned by brodifacoum. She never saw him eat it, or eat a dead animal that had been poisoned, and she doesn't use the bait herself. The first thing she noticed was the dog staggering, so off to the vet who knew exactly what it was. All that night the dog was fed Vitamin K and the owner was told that he was going to die. The only thing that saved him was the vet being able to find a blood donor. Then he was still very sick and needed Vit K for the next 3 months. My thoughts are surrounding the animals we poison with it. What would it be like to die from internal haemorrhaging? I can't think it would be a pleasant way to go. I know rats and possums are major pests in our forests and I understand that in a major control operation poison might be the only real effective way. But for me at home, I think I'll be using instant kill traps from now on. Fast, effective and a bit more humane. 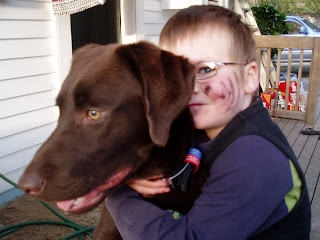 Oh, and the stuff on my son's face?? That's a drawn on Moko, or Maori tattoo. They were celebrating Matariki, or the Maori New Year at Daycare. Painting - and not the creative type! Well, not the artistic type anyway. You can be very creative with colours and I thought I was going to have to. We planned to paint the interior of our shed-soon-to-be-house with all the leftover bits and pieces of paint that have been collected in the shed over the years. There was a deep pink, a mushroom grey, an awful apricot.....the list went on. 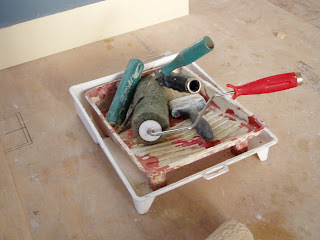 Thankfully alot of those paints were so old they were unusable! Darn!! (not really). So we ended up with painting our bedroom, the hall and Miss-almost-two's bedroom an off white with apricot tones. Mister-four got an off white with grey tones and we bought one litre of very RED paint. He got his red wall that he wanted! We then mixed some of the leftover red into some almost white and got a baby pink for one wall of Miss-almost-two. I've always hated the whole pink thing for girls, but unfortunately she likes pink - it was the first colour she learnt how to say and I DEFINITELY didn't teach it to her! Then we had to buy paint for the lounge/living/kitchen area. The kitchen already has strong colours of a sort of denim blue and a buttery yellow so I chose something called 1/4 Spanish White. Another off white (gotta love those versatile off whites!) with yellow tones so it doesn't clash with the kitchen. You can see the kitchen colours in the roller and paint try photo up there actually. 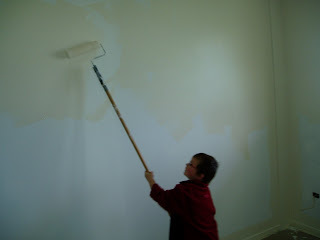 Here's my darling son (terrible photo I know) painting our bedroom. Get them working young I say! So we were planning to move in this weekend coming, but the weather forecast says otherwise. Pouring rain is not the best for moving furniture in and in fact I'm a little thankful. There was a certain stress level rising at the thought of all I had still to do. Now the pressure is off a little. Today was a day of flukes and lessons, hopefully not harsh lessons, but we won't know probably until tomorrow. 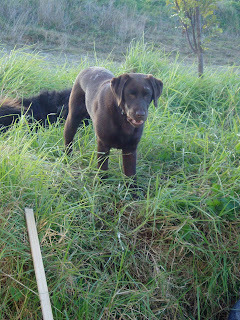 Fluke One: The puppy found some rat bait. 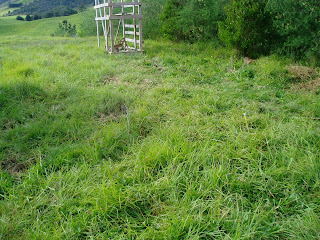 We don't exactly know how but we had some out at the land a while ago and we didn't use it all. We had it in an unmarked bag, on top of an old chiller. But when the builders cleared everything out of the shed, we think they just chucked it on the rubbish pile, not looking in the bag first. Fluke Two: I saw the puppy eating the poison. I had gone outside to take Madam-almost-two to the dunny and there was Emma, the puppy, munching into her second fist-sized bag of bait. Of course I stopped her from eating the rest, but to have caught her eating it at all was lucky. Fluke Three: My Father-in-Law was out there with us. Not a usual thing, but he was helping us paint. Fluke Four: He had driven his own truck there, not caught a ride with my DH. F.I.L is an ex-possumer and he still does trapping and poisoning as a bit of a sideline. He was the one who gave us the bait in the first place. He knew exactly what to do and he carries the remedy in his truck all the time. Washing soda crystals forced down Emma's throat made her heave up the bright green bait in about two seconds flat. So now we watch and wait. The remedy is Vitamin K and to be certain, I'll get some for her tomorrow. Never use poison if you can avoid it. If you don't have it, then you never have these problems. I always try to be organic as possible and this just gives me another reason for doing so. If you do have poisons, always keep them in a clearly labelled container and preferably in a locked cabinet. What we did was just asking for trouble and I should probably be very thankful we weren't shoving washing soda down one of the kid's throats. Know the remedy or treatment for all poisons you use or have in the house - and yes, even dishwasher powder can have devestating effects. This is a quick little quilt I whipped up recently. I make them for the hospital where I work to use on the bassinets. Makes them look a whole lot less like plastic fishbowls! 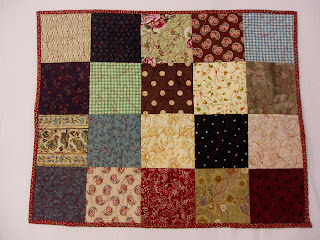 The ladies from Kerikeri Patchwork and Quilting Club donate them too. I tend to use up my bits and pieces, like blocks I made to experiment with, strips leftover from cutting, or, charm squares like this one. How easy is that! Then for the batting I use old woollen blankets I find in op shops, wool being much better for babies to sleep under, second hand is cheap and already pre-shrunk ('cause they've usually been washed a million times before) and I like recyling/repurposing etc. 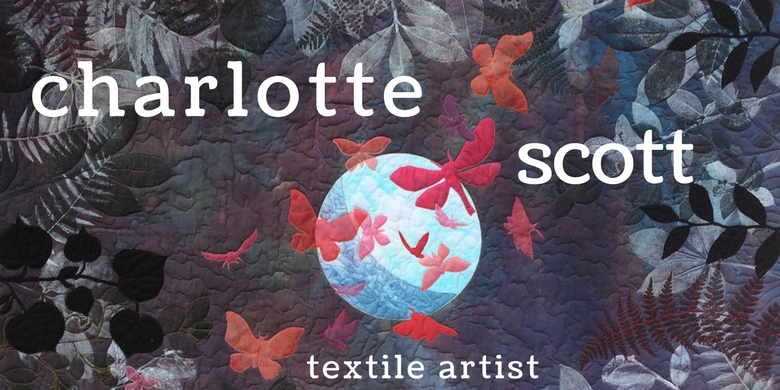 Then I use calico for the backing, because it's cheap, no-fuss and easy to write on a label. If anyone has little bits and pieces lying around like me and don't know what to do with them, approach your local Neonatal Unit or Special Care Baby Unit to see if they would like little quilts. The Maternity Units are often too busy to bother but the Special Care units often use them to make the place a bit less scary for parents. They may also use them to wrap stillborn babies in and then give them to the parents to take home as a memory. Come on, I wanna move in!! So a couple of months ago I was a little hesitant about this move, and now ALL I think about is moving in. I wake up ticking off little moving 'to-do' lists. I daydream about my vege garden to-be. I am boring my friends and whanau because every sentence begins with, "When we move out to the land..."
No striking changes in the photo. Doors on (no handles), most of the gib stopping done (nothing even remotely interesting to say about gib stopping), and all the skirtings and architraves done. For me, this weekend just gone was all about putty. When you nail architraves, skirtings and window surrounds on, you punch the nails in a bit and this leaves neat little holes. Neat little holes that my charming husband informed me have to be filled with putty. By me. Not him. Me. So 963 holes later, I'm an expert puttier. Why not him? Because he was busy knocking together a chicken run. No photos of that yet, not finished and just so rough it's embarrassing. I'm hoping it'll look better next week! So instead you get a glimpse of my new vege garden. Imagine raised beds, rows of healthy brassicas, lettuces, a climbing bean frame, tomatoes, basil.....mmm. Ok, so I have a bit of work ahead of me! Does anyone have any fabulous suggestions on how to get a nice layout to your posts? It irritates me that no matter how I fiddle with it when I'm writing it, it always ends up looking funny when I post it with weird spacing ..... ok, I know I'm a bit retentive! But please help a blog newbie out! Last weekend (I know it's late, sorry to disappoint the millions of fans who have been waiting with baited breath!) 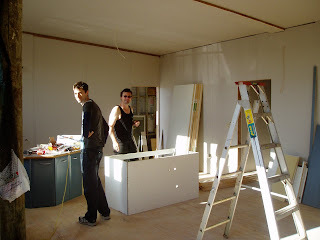 my dear husband and my dear brother, who was visiting, lifted our kitchen into place. 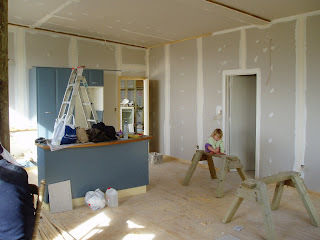 The weekend before, this room had just been insulated. 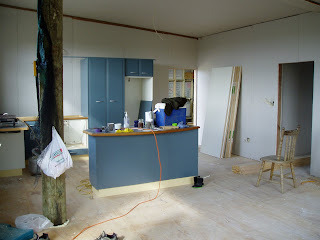 Now all the lining is up and the kitchen in place and it's really starting to look like a home. So the first pic is of the men themselves flexing their muscles and the second one is when they have finished. Of course no oven or fridge yet, all in good time. Yes, we are going to have a pole in the middle of our lounge. No biggie. I grew up in a pole house (look familiar, sisters?!) except this one spent many a year holding up a wharf, so, as my brother pointed out, we have a few interesting decorations on it, aka barnacles! This week is skirtings, architraves (think that's what they are called, those bits of skirtings at the top of the walls) and hopefully gibstopping. We may even get to paint next weekend! And just for interest's sake. Here is a cutie pic. I visited my DH's aunty and uncle on the weekend. They have a little yappy dog who sometimes needs locking up to calm down. 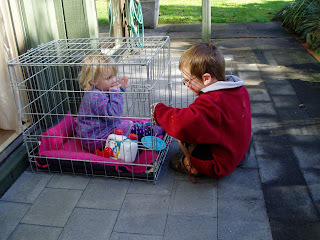 The kids thought her cage was fantastic and played 'puppies' the whole time. Might have to get myself one. Just won't tell the vet it's actually for the kids, I might have a visit from child welfare!